Handling noise occurs from 50 to 100Hz The popular ball microphones band stop their low end response at 125Hz to eliminate handling noise. Of course, they throw away an octave and a half of YOUR voice but you DO have low handling noise! Using the wide 50 Hz. to 18kHz response of the popular PR 20 diaphragm it was necessary for Heil to develop the ISO BAND tm, (patent pending) a special suspension system of Sorbothane rubber to eliminate low frequency handling noise. This new technology has brought an exciting new dimension to this amazing dynamic vocal microphone. This new Heil microphone is usable with extreme high sound pressure levels to nearly 150 dB making it perfect for live vocal and instrument applications as well as a superb microphone for serious recording studios. 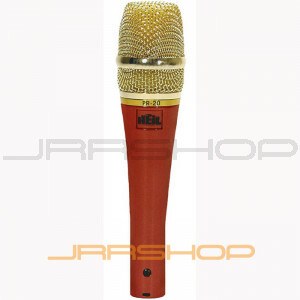 The PR 22 is supplied with a leatherette carrying bag, a mic clip and three metal wind screens (black, silver and gold).